Als ik het stamboomkleed in een plattegrond afdruk, verandert de positie. Is hier wat aan te doen? 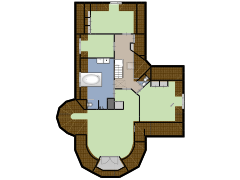 Is it possible to adda roof structure to a plan? How do you get the basic shape of the first floor onto the second floor? I understand that you can go to settings and add a second floor, but in 3D view that is what I want to see not just the first floor? how do you change the name of your rooms?? when I open my floor plan once its a PDF, the basement is the first page. How can I re-order these so the First page my Client sees is the first floor when they open it? Why will some of my rooms not separate when I draw new ones and when I go to label them it won’t allow me to label just one room due to the fact that the rooms won’t separate. Hoe krijg ik een dak wat vanaf bepaald punt schuin afloopt? how do i go through rooms through the door? hola, como puedo colgar fotos personales en las paredes de mi plano? I have done a design on the wrong floor, how do I move it? I’ve just created my first plan and have upgraded to a Plus account. Is het mogelijk schuine dak delen mee te nemen in het ontwerp van de 1e verdieping? dakkapellen mis ik ook in de mogelijkheden..
None of the publishing information shows up on the linked page. Is this normal? Also, some dimensions are showing up in Meters while on my creation page they are all in Imperial. I want to remove the black lines on top of the walls in the 3D mode. How can I do that? Alguem poderia ensinar como faço mudança na cor da parede? Is there a way to get rid of the feet/meter measuring tool at the bottom of each floor plan? How can I set a shelf to be lower than the preset height? I need to be able to adjust a shelf to be 1 foot off the ground. Quick question: does floorplanner provide a tool to offset the dimension lines to a user specified distance from each other? I can’t find it and my layout for publishing gets messy.